NGP already contains some pretty impressive motion-sensing technology, but a new Sony patent suggests the new portable could receive PlayStation Move support in future. 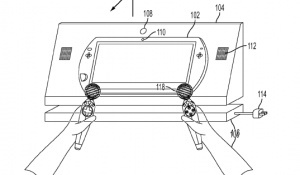 Filed by Sony in 2009, the patent reveals a special stand would be used to house the portable console, letting it communicate with the Move controller. A PSP Go is pictured in the application, but with that console no longer in production it seems much more likely we'd see NGP receive Move support. The stand includes a depth-imaging camera and is motorised, letting it track the player around the room for times when gaming gets just a little too energetic. Of course with NGP's screen being significantly bigger and clearer than the PSP Go it's not out of the question that the machine could sit in a stand and be comfortably playable from a distance. What do you make of this patent application? Do you think we'll see PlayStation Move work with the NGP, or is the idea of playing a portable console from a distance just not appealing to you? Let us know in the comments below.